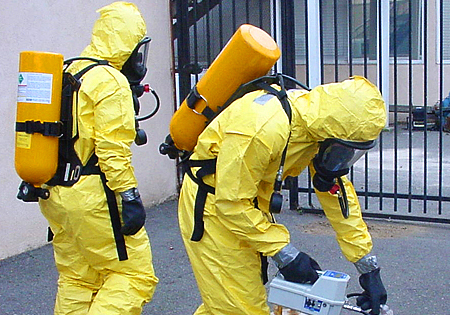 Hazardous Waste Operation and Emergency Response (HAZWOPER) offers a number of courses designed for those who need training and certification to work at a hazardous waste site (CERCLA, RCRA, or state or local government sites). Examples of those who need certification are environmental scientists, chemists, engineers, technicians, equipment operators, project managers, and fire fighters. All our courses count towards the American Board of Industrial Hygiene (ABIH) Certification Maintenance Points. The Hazardous Waste General Site Worker Curriculum complies with the California Code of Regulations Title 8 Ch. 4 Section 5192 (a-p). The course includes 40-hours of training with demonstrations and hands-on experience. Some of the activities are instrument-use exercises, barrel overpacking/leaking drums demonstrations, initial site survey exercises, decontamination exercises, barrel content identification exercises, sampling safety lecture, and confined space equipment demonstration. Participants receive extensive hands-on training to perform routine respirator maintenance. They don a variety of respiratory protection devices including air purifying respirators, self-contained breathing apparatus, and chemical protective clothing. In addition, they develop a site health and safety plan. This course is designed to meet the OSHA requirement for annual refresher training for individuals who have previously completed GISO 5192 training. Topics include incident review, hazard recognition/ evaluation/control, health and safety program requirements and regulations, monitoring equipment, safe work practices, and personal protective equipment. Emergency Response training is designed for workers that respond to the release of hazardous substances. Examples of those who need certification are First Responder Awareness (FRA), First Responder Operational (FRO), Hazardous Materials Technician, or Hazardous Materials Incident Commander (IC). Courses are certified through Office of Emergency Services (OES), California Specialized Training Institute (CSTI). 3. On-site supervisors receive 24 or 40 hours of basic training plus 8 hours of specialized training. 40-Hour Hazardous Materials Industry Technician designed for workers that respond to the release of hazardous substances. 8-Hour Annual Refresher Training designed for those who have completed the 24 or 40 hour courses for Industry Technician and Incident Commander. Fees include tuition, course materials, refreshments, parking, and certificate of completion (when course requirements are met and course fee has been paid). All our classes count towards ABIH Certification Maintenance Points. General Duty Clause: Every employer shall furnish employment and a place of employment which are safe and healthful for the employees. 29 CFR 5 (a) (1) Occupational Safety and Health Act. In the HAZWOPER trainings, we strive to inform workers of their basic employment rights. These basic rights are described below and in more detail on the California Department of Industrial Relations website. 3) you receive training about the chemicals you work with, the health problems they can cause and how you can protect yourself. The standard (GISO 3204) gives you the right to examine and copy your medical records and records of exposure to toxic substances or harmful physical agents. It also gives you the right to examine records of exposure to toxic substances or harmful physical agents of other employees with work conditions similar to yours. You also must be provided Material Safety Data Sheets or other information that exists for chemicals or substances used in the workplace, or to which employees may be exposed. Most employers with 10 or more employees must keep a record of injuries and illnesses for five years. The summary for the year before must be posted every February through April. Employers must provide this information to workers and union representatives. Employers must have a health and safety program and a person to respond to complaints that workers have about unsafe conditions. The Hazardous Waste Operations and Emergency Response standard requires health and safety training for workers managing hazardous materials or are involved in an emergency response to a hazardous waste or hazardous materials release such as: leaks, spills, accidents, or fires. Respiratory protective equipment must be worn when it is not possible to remove harmful particulates (dust, mist, fumes, etc), vapors, or gases from the air or when emergency protection against relatively brief exposure is needed. This standard lists legal limits for the amount of chemicals that may be present in the air at work. It lists the Permissible Exposure Limits (PELs) and Ceiling Limits for approximately 700 chemicals. Specific Chemicals: There are also detailed regulations for certain chemicals such as lead, asbestos, benzene, etc. You have the right to protection such as gloves, goggles, safety shoes, hard hat, ear protection, and training in how to use them. When employees work in hot conditions, employers must take special precautions in order to prevent heat illness. Heat illness can progress to heat stroke and be fatal, especially when emergency treatment is delayed. Employers of outdoor workers must comply with the permanent heat illness prevention standard. This standard requires employers to take four simple steps that include shade, water, training and written procedures. In a workplace where 2 people doing similar work have an injury caused by repetitive motion at work, the employer must train people and analyze the job in order to prevent injuries. To the extent that the nature of the work allows, employers shall keep workplaces, storerooms, personal service rooms and passageways clean, orderly and in a sanitary condition. Employers shall keep toilet facilities clean, in good working order and accessible to the employees at all times. Washing facilities for maintaining personal cleanliness shall be provided in every place of employment. Every required exit shall be kept free of all obstructions or impediments so workers can escape easily and immediately in case of fire or other emergency. Employers shall provide access to all equipment and appliances. Permanent aisles, ladders, stairways, and walkways shall be kept reasonably clear and in good repair. Permanent floors and platforms shall be free of dangerous projections or obstructions, maintained in good repair, and reasonably free of oil, grease, or water. Whenever aisles, walkways, or crawlways become slippery, high friction surfaces, cleats, coverings, or other equivalent protection against slipping will be required. Where possible, employers must insulate or guard pipes or other exposed surfaces which can burn workers. Your employer must have a lock to shut down a machine during maintenance (when someone is working on it) to prevent anyone else from turning it on. Machines that grind, shear, punch, press, squeeze, draw cut, roll, and mix or have similar action and in which an employee comes within the danger zone shall have a guard at the point of operation. Only drivers authorized and trained by the employer shall operate a forklift. ARLENE FEINGOLD works as an Industrial Hygienist at the UCLA Department of Environmental Health and Safety and has worked for LOSH as an instructor in the HAZWOPER PROGRAM since 1994. Ms. Feingold has also been active as a curriculum advisor and has participated in developing and updating the curriculum now being used in the HAZWOPER PROGRAM. Ms. Feingold is the Outreach Coordinator for the Southern California NIOSH Education and Research Center, which is administratively housed at UCLA. She is actively engaged in helping the Center work on reaching out to all levels of management within business and industry, to leaders in government, to other academic institutions, and to workers to increase their awareness of workplace health and safety issues and safe practices. FRANK PARR has worked in the field of Occupational Safety and Health for the past 25 years in both the private and public sectors. He has worked on a variety of different projects dealing with a broad spectrum of hazards including: groundwater and soil gas monitoring, well installation and sampling, soil, soil vapor, groundwater and air sampling, building/facility assessment, decontamination, demolition and remediation of aerospace, plating, metal-finishing and other industrial process facilities, underground storage tank removal, permit-required confined space entry and classification, industrial hygiene process safety audit and program generation. Mr. Parr has had the responsibility of controlling hazards and developing protocols to protect workers against a wide range of chemical, biological and physical hazards including: benzene, dioxin, lead, arsenic, butadiene, chromic acid, lead azide, TNT, picric acid, PCBs, histoplasmosis, psittacosis, coccidioidomycosis, ticks, rattlesnakes, fleas, poison aok, high voltage electricity, underground and overhead utilities, elevated work surfaces, permit-required confined spaces, trenching and excavation hazards, heavy equipment, ionizing radiation, compressed gas cylinders and elevated noise levels. He currently manages a staff of four industrial hygiene personnel in three offices providing occupational safety and health support to more than 1,000 scientists, engineers, geologists, toxicologists and analytical chemists throughout California. MARVIN VIRGIN is a retired Fire Captain with 25 years of service with Departments on both the East and West Coasts. In 1991 he received his Fire Officers Instructor Certification from the California State Fire Training Institute and, in 1996, became a Hazardous Materials Technician. His experiences with Hazardous Materials include first line responses as a Hazardous Materials Technician, and administrative experience as the Hazardous Materials Coordinator for the City of Inglewood. Mr. Virgin was an instructor with the South Bay Fire Training Academy and was a public education officer for over 15 years. His duties included providing fire service instruction to fire trainees and public sector instruction in first aid, cpr, and fire safety. As an instructor, Mr. Virgin brings to the UCLA-LOSH program real world experience in prevention and mitigation of Hazardous Materials incidents. YOLANDA GARZA is currently serving as a Supervising Hazardous Substances Engineer and Unit Chief for the California Department of Toxic Substances Control under the School Evaluation and Brownfields Outreach Branch of the Cleanup Program. She is in charge of a staff of engineers, geologists, scientists, and administrative staff conducting various phases and types of investigation, remediation and oversight throughout the state. Ms. Garza oversees and assists staff in a range of technical, regulatory, and outreach for cleanup efforts and public presentation and communication of hazardous materials and waste management in California. Her expertise and implementation of state and federal regulations include Comprehensive Environmental Response, Compensation, and Liability Act (CERCLA), Resources Conservation and Recovery Act (RCRA), California Environmental Quality Act (CEQA), Title 22 of the California Code of Regulations, and the California Health and Safety code. Applications of cleanup range from hazardous waste facilities to redevelopment and industrial facilities to residential areas and schools in California. Mike Hagen, Robert Kamm, Magdalena Ordonez, and Simon Sage.